Pizzas are one of my favourite. I love eating them though I don't always bake them. Sometimes I think if we could pinpoint something that mobilised India to modernise or grow or urbanise pizzas would have an imporrtant place along with or slightly lower than internet and cell phones. My association with pizza started in my late teens. A Pizza Corner franchisee had started near college and I had been there once or twice for a treat with friends or cousins. Within a year or two they started mushrooming everywhere and now wherever you go you can be assured your slice of pizza will be waiting for you with the same taste,same quality etc. The pizza craze had reached such an extent that I laughed my head off when I heard of "Idly Pizza" which was nothing but pizza sauce and topping on an idly and steamed again. Ofcourse it might be good and we can definitely try fusion cuisine but somehow on hearing such name my impulse is to laugh. Anyway later my knowledge about pizzas increased and I started baking them first through mixes and then from scratch.And thanks to Baking Partners this time I found my favourite and the best one - NY Style Pizza.I have tried the second recipe suggested by Archana of TangyMinds from Serious Eats. New York Style Pizza is an American version of the Italian pizza and is generally large/wide, thin crusted foldable and crispy. There are other American versions also but this one is popular in East coast. Being Large it is usually sold as slice and have only sauce and mozzarella as the toppings. Though ofcourse we can keep these as the base and add our own topping. I had halved the recipe and had tried working with only two portions of dough while freezing others. I went for a tradtional sauce and cheese topping for one and with the other it was gourmet with pineapples,black olives and onions. I blanched the tomatoes and peeled them. You can also use fresh ones though cooking time will increase. Puree the tomatoes in a blender leaving occasional mini chunks. Meanwhile, heat oil and butter in a deep saucepan. Add garlic,oregano,pepperflakes and a pinch of salt and saute till garlic cooks but not brown. Add in tomato puree, onion, basil and sugar. Bring to a simmer on lowest possible heat and let it cook for another hour or so till it is reduced to half. Remove from heat, adjust salt and let it cool.Then it can be stored in hte fridge in a covered container for upto about 2 weeks. Combine flour,sugar, salt and yeast in the bowl of the food processor or if kneading by hand then in a wide,deep bowl. Pulse/Mix together for 3-4 times till well incorporated. Add EVOO and water. Pulse/Mix for few more times till you get a dough ball.Transfer the ball to a floured surface and knead once or twice to get a smooth dough ball. Divide the dough into 3 equal parts and store covered in a ziploc bag or container in the fridge for atleast overnight or upto 5 days. I divided into two equal parts and chilled these. I worked with only one piece and the other after two days I transferred to the freezer. 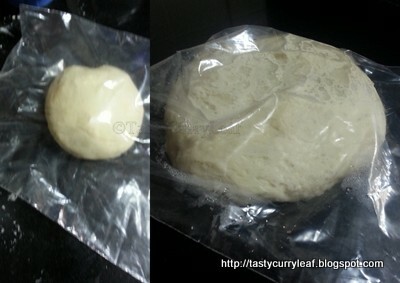 In the fridge, definitely the dough doubles up and you can take it out of the fridge 2 hours prior to baking atleast. Gently shape the dough ball into a circular/round shape in a lightly dusted surface - the dough will be slightly sticky at this point.So flour is needed to shape these. 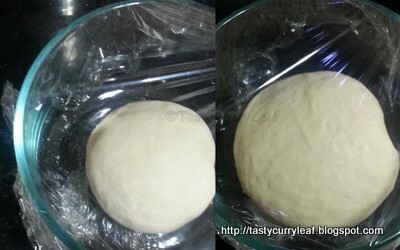 Keep the round dough ball tightly covered in separate dishes. I divided my dough piece into two, shaped each and let each rise separately till doubled for another hour or so. Transfer the dough ball onto a lightly floured surface. Shape into an 8' circle leaving the outer 1' higher than the rest. Gently stretch by draping the dough over the knuckles into a 12-14' circle about 1/4' thick.Transfer to a lined baking sheet sprinkled with semolina/cornmeal. My shaping is not perfect. By the time I draped over my knuckles and placed in a pan the shape became something else. You can see this video also for stretching the pizza and also the tips from this site. Spread a thin layer of sauce followed by sprinkling of fresh grated mozzarella. 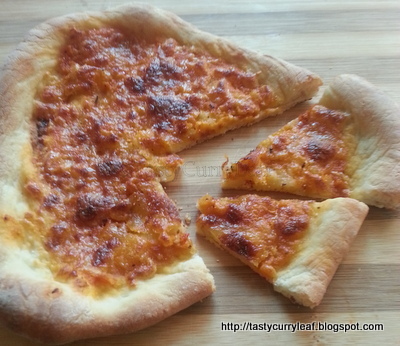 Bake the pizza in a preheated oven at 400F/200C for about 10-15 minutes until it is golden brown and the cheese melts and the crust puffs up. 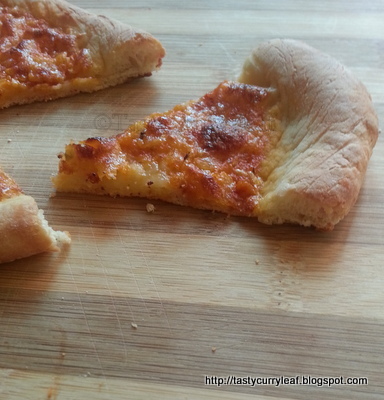 Enjoy the best pizza with your family not store bought, but from scratch. 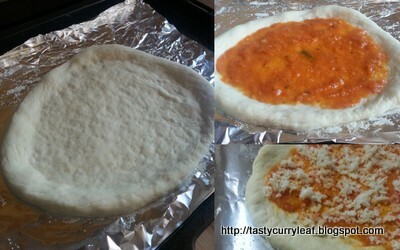 Thanks Swati & Archana for the excellent pizza recipe. Your pizza looks beautiful! Love the simple choice of toppings! It looks very classic, I love it. Sometimes you just need a slice of basic ny style pizza for comfort! I too join with in laughing the ildy pizza and bread pizza thing, Love you pizza Sweatha. Wonderful pizza dear! Wish i cud have an slice!! 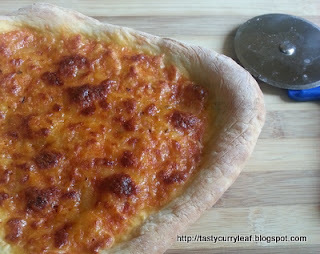 Loved this home made pizza very much..
Lovely :) Nice Nice step by step presentation wise :) Hope u enjoyed!! 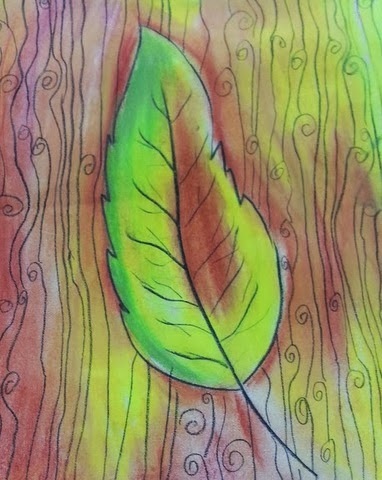 !Visit my space once u r free.